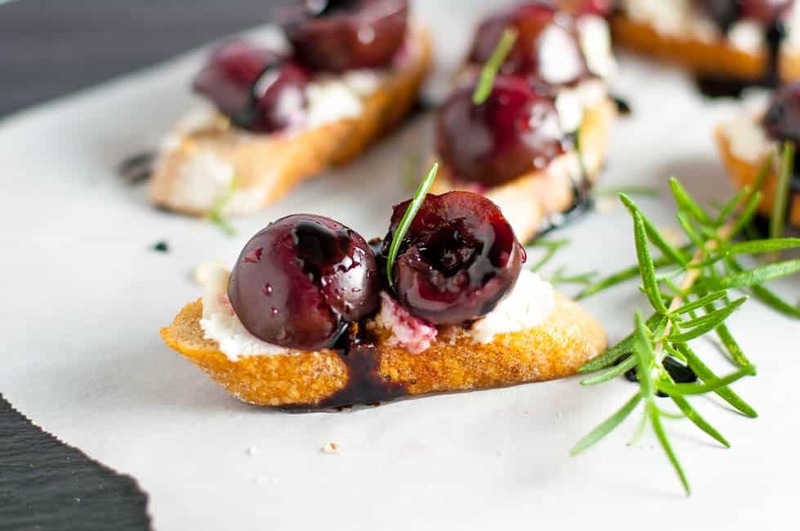 Welcome cherry season with these two-bite Roasted Cherry Goat Cheese Crostini! Cherries are plentiful this year and the farm down the road is open for picking! Cherry season is such a short one, so I just had to get some while they’re available. It’s so hard to stop eating them once you start! 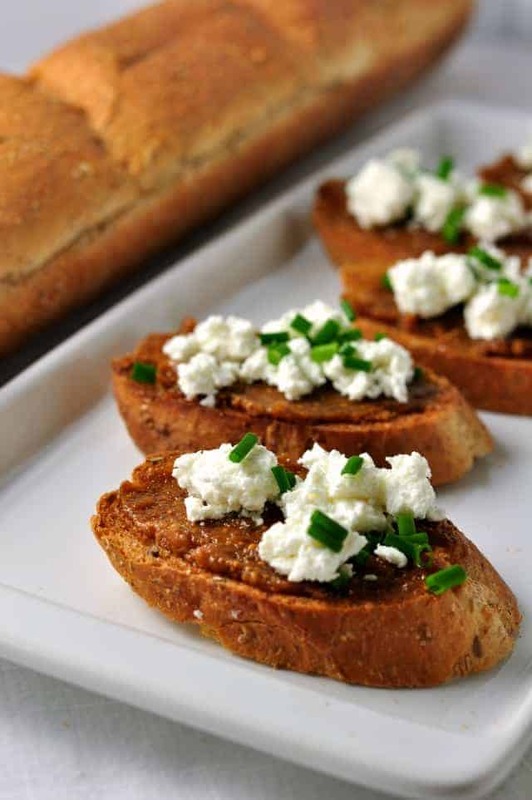 I managed to save a few to pop on the top of these crispy goat cheese crostini appetizers. So glad I did! Crostini appetizers are always popular when I serve them. You can pack a lot of interesting flavour combos on top of one small slice of baguette! If you love creating crostini as much as I do, check out this post on 5 Tips for Making Crostini which outlines common mistakes and how to avoid them. 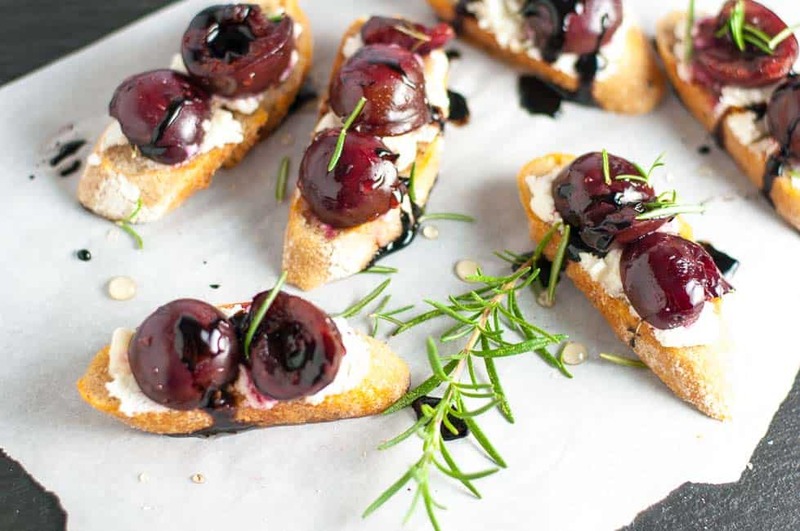 These Roasted Cherry and Goat Cheese Crostini rate right up there with my other favourites. We gave them a 10 out of 10. They’re sweet, and yet they’re savoury. They’re crispy, but creamy. 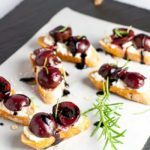 Tiny toasts, smeared with salty goat cheese, topped with rosemary roasted cherries and drizzled with honey and balsamic glaze made an appy to remember, or “one for the blog” as we say. As you know, I avoid gluten in my diet, and gluten-free baguettes are now available, often in the freezer section. My local bakery sells products made with ancient grains and I’ve found that spelt flour agrees with me. I used a spelt baguette in this recipe, but any baguette will be successful. and devour these little gems before they’re gone for another year! 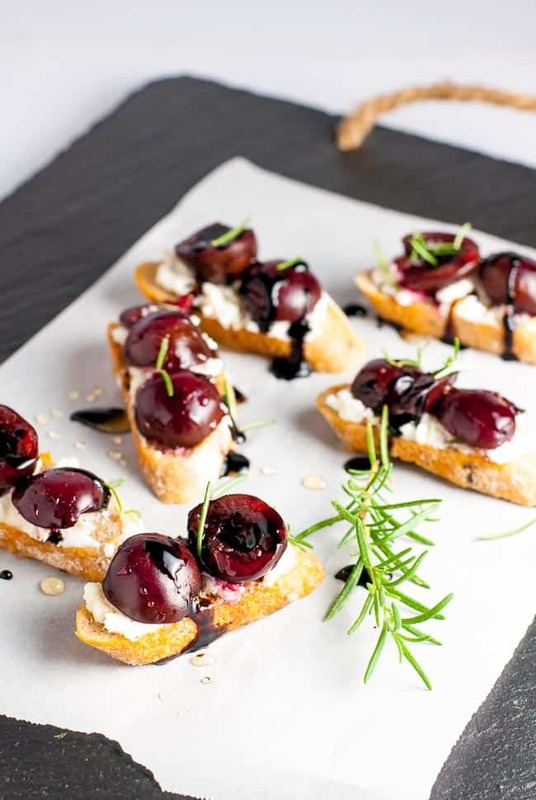 Enjoy cherry season with Roasted Cherry Goat Cheese Crostini with Honey and Balsamic Drizzle. They're tiny toasts topped with creamy goat cheese and sweet cherries. Slice the baguette into 1/2 inch slices. Brush lightly with extra-virgin olive oil. Bake at 375°F for 7 – 8 minutes, turning over halfway through until golden brown. The crostini should be slightly crispy on top but the inside should be tender. 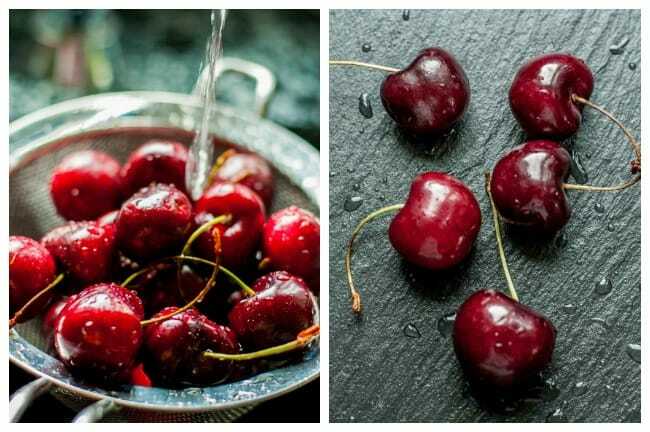 Spread cherries on a parchment-paper lined baking sheet, Drizzle with a little olive oil and sprinkle with chopped fresh rosemary. Roast in the oven for 5 - 7 minutes while you're toasting the baguette. Spread each baguette slice with goat cheese, top with two roasted cherry halves, drizzle with honey and balsamic glaze and sprinkle with coarse sea salt and fresh rosemary. Serve and enjoy! 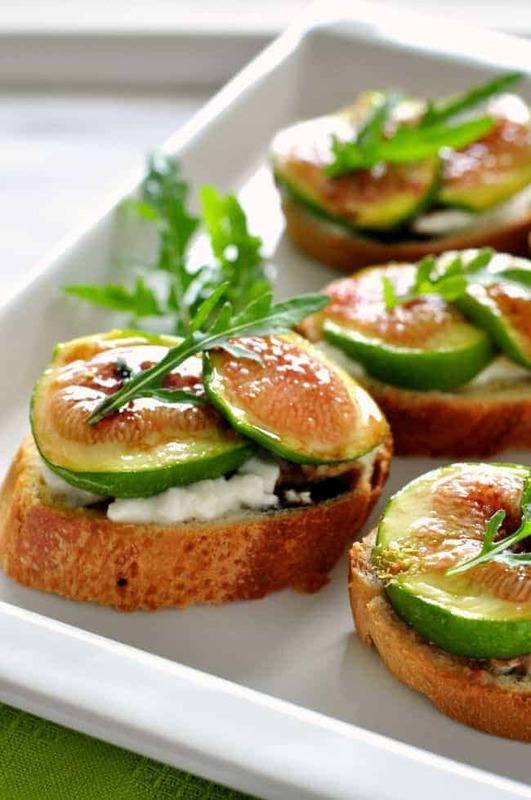 Here are more delicious crostini ideas for you! Thanks! Can’t get enough of these little bites! Mouth watering! 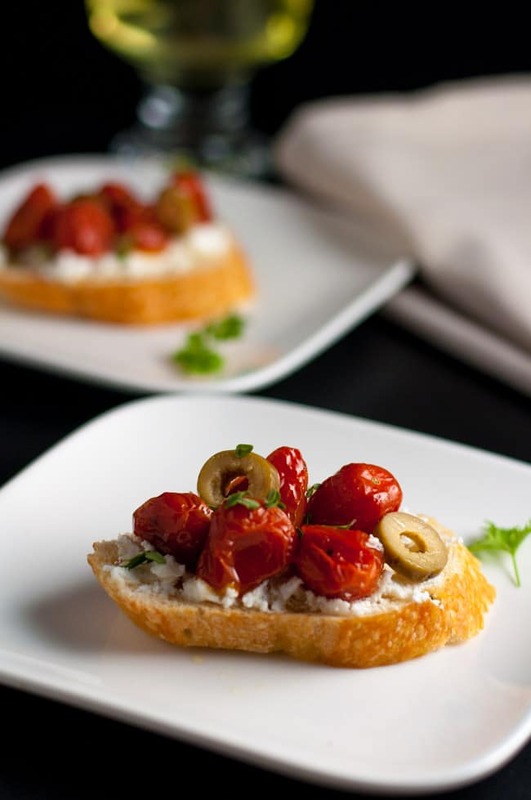 Thinking a few of these crostini and a glass of Pinot Noir would make for a perfect Friday night! You’ve got that right. And that’s exactly what we did–(actually while binging on Netflix):) Thanks, Meaghan! This looks absolutely stunning. We were in BC last week and the cherries were delish. Can’t wait to do something with them now that we’re home! Hi Shauna, Cherry season is such a short one! Hope you get a chance to use them–they’re just SO good! Thanks Isabelle! My fig tree is loaded this year, but they’re not quite ripe yet. Can’t wait! There’s nothing quite like a juicy fig right off the tree, except, of course, freshly picked cherries . . . Thanks for stopping by! Score all the points you can! 🙂 Hope you get a chance to make these.